Every parent knows how precious family dinnertime is. Or how chaotic. I guess it all depends on how you look at it. Let's be honest. Pinterest is awesome for all sorts of ideas but not every family dinnertime is Pinterest perfect. Despite the best of intentions, I would argue that much of what happens at family dinner does not go according to schedule or a plan. No matter what has happened that day adults, kids, and dogs are still expecting a meal. It doesn't mean it's a negative thing, it's just real life. 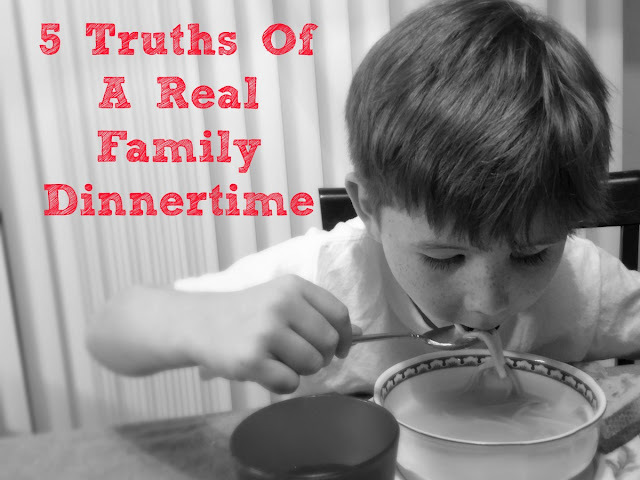 Because real life happens here are 5 truths that apply to most families at dinnertime. Parents don't really need a timer for cooking food. You always know when the meal is ready when you hear, "I'm hungry, isn't dinner ready yet" seven times. Or is it seventeen times? Sometimes I miscount. It doesn't really matter. Even if you start cooking at 2 pm dinner still won't arrive soon enough for a ravenous fourth grader. The one fortunate side effect of kids being constantly hungry is that they are ready to dive in at a moment's notice. The unfortunate part of this is that whatever food you prepare, they always want the other one. Sure they were addicted to plain white rice with butter last week. This week it is that dish is much too spicy. Did you make the deadly mistake of picking the can of Campbell's Tomato soup? The correct choice was the Chicken Noodle. Unless it's Thursday or every fourth Saturday. of times a kindergartner gets up from their seat they were training for an Olympic sport. All I know is that I don't care if the most brilliant scientists in the world can send a ship to Mars. All I want from those geniuses is to devise a way to keep my kids seated for longer than 3.2 seconds. It's amazing how you can't keep the kids out of the kitchen until you actually want them to bring their dishes to the sink. By the time dinner is over Sherlock Holmes himself couldn't find the rest of your family. Your dining room area turns into a scene from one of those TV shows where there is only one person left in the world. And that person is you....with a sink full of dishes. Despite all the truths above, every parent also knows just how precious dinnertime is. You learn about the ups and downs of your teenager's day. You have the chance to experience your 5 year old kindly sharing with their baby brother. Lastly, you are given the opportunity to experience a few moments where you are putting aside your frustrations and enjoying time with the family you love. That is until it's time to get ready for bed. What dinnertime truths did I forget? Let me know in the comments below. 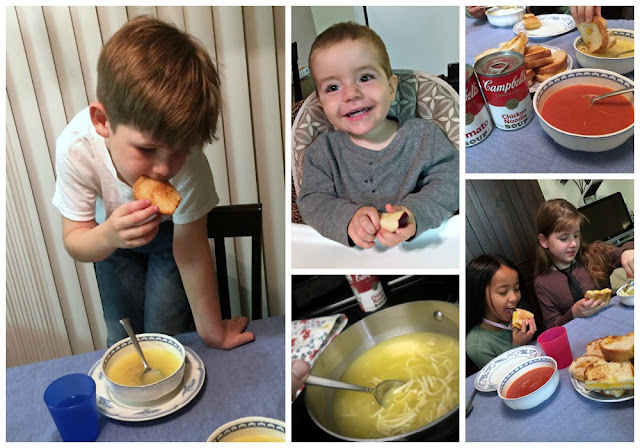 Make sure and check out Campbell's Soup on Facebook, Twitter, and Instagram and share your own real dinnertime truths, special memories, and pictures using the hashtag #RealRealLife!